Comtek is the UK’s fastest growing multi-vendor IT and telecoms repair service, and is committed to extending the working life of legacy IT and telecoms equipment – irrespective of its age or manufacturer. Helping its Pan-European customers to reduce unnecessary waste and minimise the impact of IT refuse on the environment in a practical and cost effective way, Comtek repairs and refurbishes a range of both current and legacy data networking and telecoms hardware. Comtek’s repair activities greatly extend the working life of communications hardware, reducing costs for customers, protecting the environment, and providing sustainability for the IT industry. Comtek promotes repair and reuse as a powerful means of dealing with the global environmental and economic challenges. Comtek has highly developed and efficient Repairs, Sales, Logistics, Accounts and General Administration departments. It has recently completed construction of a third outstanding repair lab equipped with various telecoms test infrastructure such as Microwave/ RF/GSM/ Optical/VOIP and BGA rework system. Nortel’s demise as one of the world’s largest telecoms company has created an amazing opportunity for Comtek. It has embarked on a European-wide PR campaign to establish Comtek as a power house for Telecoms, especially for the complete range of Nortel products repairs. 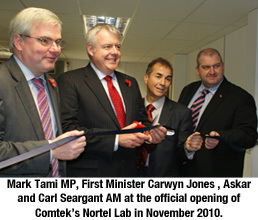 Comtek has invested and acquired many million dollars worth of Nortel infrastructure to enable it to build a world class Nortel repairs and support centre at the Deeside facility. Comtek aims to become the only technology power house to be able to provide comprehensive repairs and remanufacturing support for every Nortel product range. We are continuously searching to identify and recruit high quality ex-Nortel sales and engineers to strengthen the existing Nortel team. Comtek is now well on course to achieve its ultimate goal of being recognised as: “The world’s leading provider of component level repairs to complex networking, telecommunications & IT hardware products”. Much of the profit arising from increased business has been reinvested. These increased levels of business activity have prompted Comtek to increase its staffing levels of engineers and support staff by nearly 50% over the last two years. Comtek’s economic growth and its contribution to the development of environmentally sustainable working practices have been recognised by a number of awards. As well as engaging its own employees in an environmental awareness campaign, Comtek works through local government and at a Parliamentary level to engage the support of communities and policy makers in sustainable practices with regard to e-waste. Further details of Comtek’s ongoing campaign against e-waste can be found here. 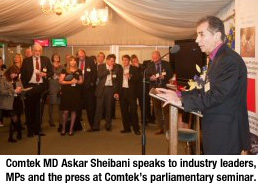 Comtek does not see itself as separate from the local community and is continually looking at ways of bringing business and community issues together. The C.E.O., Askar Sheibani, is chair of the Deeside Business Forum, a Welsh Government “Entrepreneurial champion” chair of the Deeside Enterprise Zone Board, a CBI council member and a member of the local Regeneration Board. 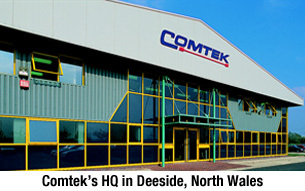 Comtek’s offices in Germany and Holland provide the same high quality services as our HQ in the UK. The Dutch office operates internationally with their focus on Europe. They have their own repair facility for the major players in the telecom / network services industry. The office has professionals in all departments from various European countries working in Hoofddorp (near Schiphol Airport). Their highly skilled repair engineers work hard every day to repair network / telecom products from all leading manufacturers and the quality of the repair activities is ranked amongst the best in Europe. Comtek BV’s customers are leading System Integrators, Maintenance and Support Service providers, Distributors, Manufacturers and End users in The Netherlands, France, Scandinavia, Italy, Spain and many other countries. The customers are leading System Integrators, Maintenance and Support Service providers, Distributors, Manufacturers and End users in Germany, Austria, Switzerland and many other countries. The office in Germany offers 24/7 maintenance services and Third Party RMA services for Germany. Both the Dutch and German office offer a wide range of maintenance services and tailor made maintenance agreements. Offering 24/7 maintenance services and Third Party RMA services throughout the Benelux and Germany. With an experience of more than 15 years the German and Holland office offers an excellent service in the distribution chain of the biggest manufacturers in the world.